Marilyn at 4 You With Love has invited me to join a game of online tag by answering 11 questions and passing 11 more onto 11 other bloggers. I'm gonna break the rules of the game a little bit though and instead of tagging more blogs, I'll throw the 11 questions out to you guys - you can answer in the comments or just drink more coffee and read on, according to what pleases you. Before I start I'd like to mention that Marilyn values a lot of things I value too, like being organized and living green and - naturally - knitting a lot. Plus, she's handy: she not only recovered a chair a whole lot better than I did the first time I tried, she documented the process so thoroughly I'm almost tempted to try it again. (almost.) You should check out her blog! 1. What blog inspires you most? Even split between SouleMama and Attic24. Ironically I'm not interested in farming/homeschooling or crocheting myself, but over and above these focal points both blogs read like magazines with great pictures. I'm often motivated to incorporate something I've seen there into my own day. Maybe if I had to take a point from one to the other it'd go to Attic24, because I looooove England so much and miss being there since I became too cowardly to fly. Lucy's put me onto a lot of little tastes of life there that make it easier for me to be in Canada all the time instead. Wowza. I had to look up my oldest post to get the answer to this and, gah: coming up on 4 years of posting at least once practically every weekday. And I wonder why I haven't put together a book-length manuscript in a while. 3. How many blogs do you have? Two. I started with my Procrastination Diary, but when I got to knitting all the time I feared the non-knitting readers would hurt themselves banging their heads on a nearby wall, so I launched Hugs For Your Head. I posted at both every weekday morning for a year or two I think, then eased back on the Procrastination Diary. I post there whenever I'm doing or thinking about something cool that's not knitting. 4. Do you have a schedule for your blog or do you post randomly? 5. What is your go-to easy meal when you don't have time to cook? Soup from a tetra pack. With toast if I remembered to pick up bread. 6. Does your blog have sponsors and if so, how did you acquire them? 7. What is your favorite way to have people follow your blog? Any way people read what I write is good - it just makes me happy that people want to do that! 8. What is your next big decorating/remodeling project? Red and anything. At the moment I'm in love with red and robin's egg blue with hits of white and brown. 10. Do you use a PC or Mac? First one, now the other. 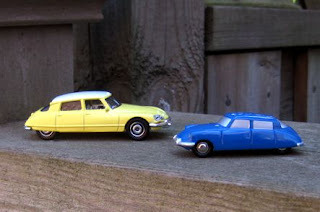 A Citroen DS, which I would never ever have the courage to drive I'm sure. I still remember the first time I saw one... they are so dreamy. I almost never see them in Canada so I have these models to gaze at adoringly when I need cheering up. Aren't they pretty? The Easter Bunny brought the yellow one. Is that 11? Okay, here are my 11 for you - answer as many or as few as you like in the comments. 1. a/ Did you know you can knit in the round on straight needles? and b/ Would you ever try doing that, or just look at the person who suggested it like this is crazy, and wave a circular needle in front of his/her face? 2. How many real-life, physically-near knitters do you know? Seriously, I have like 3 local knitting friends and one of those is a friend of a friend I've never met in person. The others I met online and would be lucky to see once a year. 3. Process or product knitter? 4. Chocolate or maple fudge? 6. If you like a pattern in a magazine and buy it so you can make it, do you take the time to photocopy the pattern or just cart the magazine around in your knitting bag till it's all bendy and dog-eared? 7. What about if the pattern is in a book? (side note: one time I was knitting something from a book that I hadn't taken the time to photocopy and then suddenly had to go and spend an open-ended amount of time by an hospital bed in an emergency and Lannie wrote out the pattern for me by hand. Even though she doesn't knit and had no clue what all that coding meant, just so I wouldn't have to cart that heavy book around on top of everything else. 8. Do you have a non-knitting friend who 'gets' your knitting enough to write out a pattern for you? Lucky! 9. You're going on vacation: what's the first thing you look into? a/ airline safety b/ clean socks and underwear c/ a book to take along, or d/ what knitting to bring? 10. What's your favourite way to cram exercise into a busy day? I was reading about this town in Europe where business people go to lunchtime dance parties in a parking garage to get in some cardio and I would totally do that if I didn't routinely work (which sometimes means 'knit') through lunch. 11. Preferred movies to knit to: a/ romantic comedy b/drama c/ western d/ action e/ sci-fi? Bonus fun fact about me: I kinda like westerns. I'd hate to have to live the way settlers did but the story arcs are so human. Okay, you're it, if you want to play. And now I gotta go Kitchener a recently-finished Thing or I'll have nothing exciting to tell you about tomorrow! 1 a/b: I had no idea, and OMG MUST LEARN NOW! Love circs, love DPNs, and will go out of my way to convert a flat pattern to round if at all possible. 2: None (sulk), though that means that my non-knitter friends are very easy to impress with simple things that look complicated. 3: Process or product? Yes. Also a total beginner who prefers attempting to write patterns than go with somebody else's directions. Brave or stupid? Also yes. 5: Silly and amusing always trumps both form and function. 6/7: Always a paper copy, often more than one after the first gets covered with too many notes and mods. 9: Vacation means books and knitting. 11: I read more than watch tv/movies while knitting, and love my Kindle (no pages to hold open!) even more as a result. But I usually read scifi/fantasy. Ohhhh... Ang., you can read on a Kindle while knitting??? I so have to look into one of those.